Unbelievable fun! 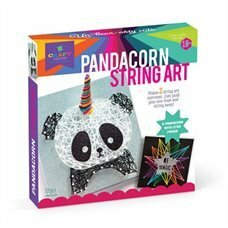 Make a fun starburst and a sweet panda with a 3-dimensional, yarn-wrapped horn. Whether you use our patterns or create your own design, it's easy and fun!Just push pins into the foam canvases and string away, no hammer or nails needed. Makes 2 string art canvases. Just push pins into foam and string away!